The trial without jury against thirty-five year old Renan Briceño for the 2012 murder of Dale Tillett came to an end today. This morning, Justice Troadio Gonzalez heard closing arguments from both sides in the case which started last week Wednesday…approximately two years after being on remand. Briceño, a former Marketing Representative of SMART, was initially charged with attempted murder after he allegedly shot twenty-one year old Dale Tillett twice—to the head and the buttocks—while leaving the Palm Island Night Club after eight on New Year’s Eve in 2011. But the charge was upgraded to murder five days later when Tillett succumbed to his injuries at the K.H.M.H. A total of sixteen witnesses were called by prosecutors, Shanice Lovell and Porsha Staine. The main witness in the case was Albert “Long Johns” Fuentes, who was one of the four persons killed in the 2013 George Street Four Massacre. Fuentes’ statement, however, in which he claimed he saw Briceño shot his friend, was admitted into evidence by the judge. In a dock statement, Briceño says he heard gunshots and saw his friend, Julio Caceres, who is also now deceased, running and that’s when he decided to take cover behind a vehicle. According to Briceño, he then got back his licensed nine millimeter pistol from Caceres just before police confiscated the gun. Justice Gonzalez has reserved ruling for a later date. 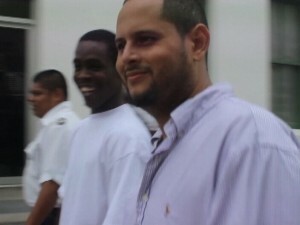 Briceño was represented by attorneys Ellis Arnold and David Moralez.